Miniature sewing paraphernalia. Need I say more? Well, if I do, this little beauty comes from Karlita's shop. 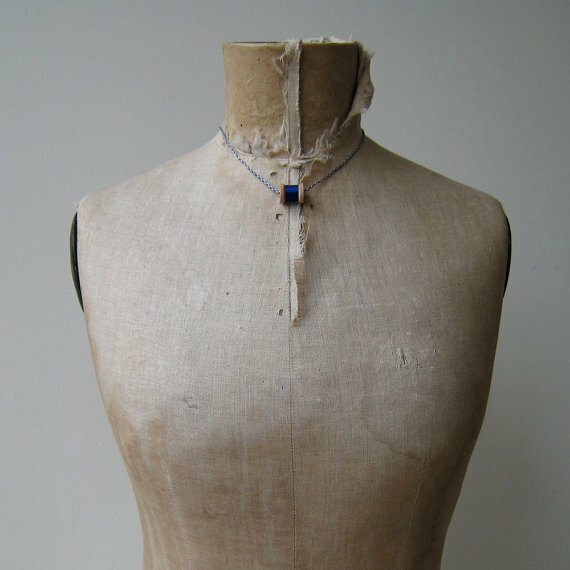 She not only carries this seamstresses necklace, but she makes rings, scarves as well as other jewelry designs, coming all the way from Belgium. 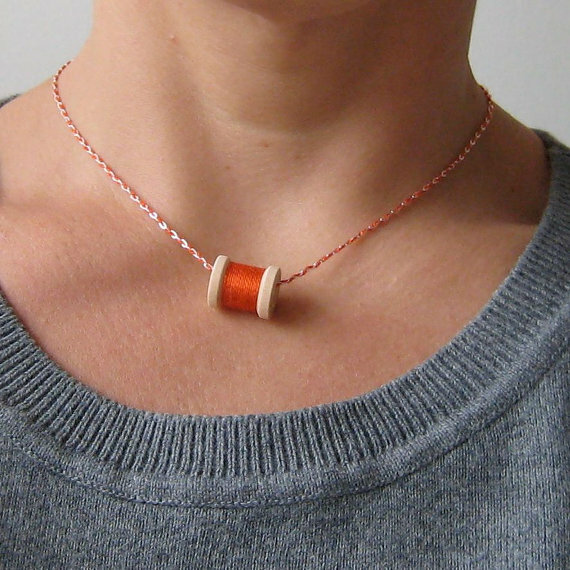 The chain is sterling silver, and she weaves a bit of color into it for an added pop. I would, of course, choose orange. But I know there are other colors out there, too. Sigh. That just makes orange even more beautiful, don't you think? ➊ What color of spool would you choose? Is that the color that is usually threaded in your machine? ➋ Please include your email address, if it's not linked to your profile, even if it's in the form of email at gmail dot com, if you're worried about spam. Please, oh, please. Are you thinking of stocking stuffers? These would make great ones! These are so great! I would of course choose orange too! You'll often find orange thread on my machine! it's a close call, but the green and gray is my favorite. Blue is my favorite. I have a ridiculous amount of blue everything! I love the red or the grey green one! I would love a green one even though ecru is what's usually threaded on my machine. I would choose either black or red. Red, because it's my favorite colour when it comes to sewing, and black because I'm really not much of a flashy dresser!! What a "find". I love the spool necklace, but also her scarves and other felted jewelry. I would pick red with the extended chain to wear over turtlenecks this time of year. Yes, I sew quite a bit with red thread. Love it! I like the grey one and come to think of it, yes, that's what's most often threaded on machine. This is so cool! Thanks for the info about this shop. I would choose the green for sure, although I usually have a neutral color thread in my machine because I love sewing with colorful fabrics, and I'm never sure what color thread to choose. Happy Thanksgiving! I would pick the one that's in between aqua and turquoise for my daughter as a gift. She's really getting into sewing lately, and she loves to wear necklaces. :) Another great giveaway, thank you. beautiful necklaces! i would choose yellow! i don't know if there is one color that is most often on my machine...i always seem to be changing. happy thankgiving! The gray green one is beautiful! My heart swooned when I saw the green one! That is so so cute! I'd love the any, but for now I like the greygreen. I hope not, because they are lovely and I would LOVE to have one. I would chose purple because it's my favorite color. And it's also Anastasia's favorite color. Then we could share it. These are so cute! I remember that I already saw them somewhere on the Internet, but I had forgotten about them. Thanks for reminding me! On my machine I almost always have black, red or white thread, but I would choose the greygreen one - suits my mood this fall! I could barely choose a favorite. 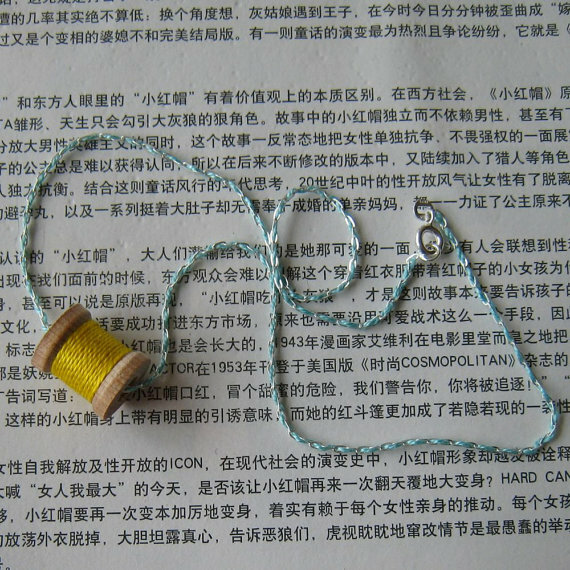 Tiny necklace and sewing notion, sigh...so cute! I love the fuchsia one. :) Happy Thanksgiving! I am loving pink with orange right now...love it! Gold is my choice color on my machine. I love gold. I'd most likely select blue. Colors are so hard to decide on! I might choose the classic black spool! And yes, that is usually the colour my machine has threaded! I would choose blue, because I would be giving it to a friend. I would choose silver -- I think it would really dress it up -- but that's not what I usually have in my machine. Basic bog standard white seems to live there. I would definitely choose the darker purple one, my favorite color. I would love to have a blue one for my daughter, purple for me. My machine is usually loaded with a boring white- I need to add more color to my life. Cute! I like the blue. That yellow one just makes me smile! Unfortunately, the color most commonly in my machine is boring old brown. tiphaine_o at hotmail it is....Thank you. I love the yellow, it's so friendly! I am a green girl! I absolutely love the green one, but I would probably pick something that my sister would love as a gift instead. I would choose purple or navy... navy is most often threaded in my machine...I'm slightly obsessed it! I love this! Super duper cute! I would choose purple. It's not usually threaded in my machine, but I do love me some purple. I want to say I'd go or a bright colour like the green or red but I know I'd probably end up selecting black! i love the gorgeous red. i should try that color in my sewing more often! Love the orange too. I always have whiite in my machine. I would go with fuchsia. And yes, it *is* the color that is usually threaded in my sewing machine! I am blue girl, so I would definetely pick the blue one. I would choose a royal blue. And yes I feel about royal blue how you feel about orange. There is never enough. I would choose orange for me, but blue or pink for my sister. I think I would give it to her if I won. How adorable! I really am drawn to the blue one. Thanks! I'd go for the fuchsia but they are adorable in any colour! I can't decide between purple (my favorite color) and orange. But I usually have plain white threaded on my sewing machine. Yellow and, unfortunately, I'm boring - white is on my sewing machine. I love the aqua blueish chain with the yellow thread. My sewing machine is usually threaded with pink thread. I know, I'm such a girly girl. Love the orange. I don't sew but my mom does and this reminds me so much of her. I adore the yellow thread! It would match my yellow boots and the purse I'm about to make with yellow, black and white fabric. :) L_N_K_V (at) yahoo (dot) com. How cute! I'd love a yellow spool. I would chose red which is surprisingly rare in my machine but a mainstay of my wardrobe. Or turquoise which I'm loving with red right now. My machine currently has a day-glo yellow. I would absolutely choose orange, even though my machine is threaded with chocolate brown right now. Hello Katy, I'm not sure why my original comment wasn't posted, maybe I did something wrong? So I'll try again! I would love the grey-green spool or the red one for my mum and I usually have purple, black or white on our machine. I would pick a dark purple/plum color, but i usually have plain white or black in my machine. I would choose either Fuschia or blue. My machine is often threaded with pink. My little girl LOVES pink! These are super cute! Love the turquoise spool! Green is my very favorite! White is usually on my machine. Or chocolate brown lately. How cute! I think I'd pick black or grey...or maybe red. Any of those colours could be found in my sewing machine. I love blue! Thank you! i would pick the blue for sure, but i usually just sew with white. I would choose purple of course! And although that's not always on my machine, I have quite a few fat purple bobbins in my sewing box! I like the orange too! I think white is what's in my machine right now--or yellow. I just finished up something yellow for my tiny girl. I've always been a green girl but lately it's all about yellows and oranges! I love the turquoise colored necklace. The turquoise/green combination is really lovely. What a neat necklace! I'd choose purple. Loved all the colors I saw. I have different colored thread in my machine depending what project I am working on. These are so darling! I love the grey-green one. I would probably pick blue. Orange or green would be my favorite. I love that yellow and blue one! I would have to go with the gray green. Probably the green but I love all her colors!